Apothecary jars on the cheap! This is just an FYI post. 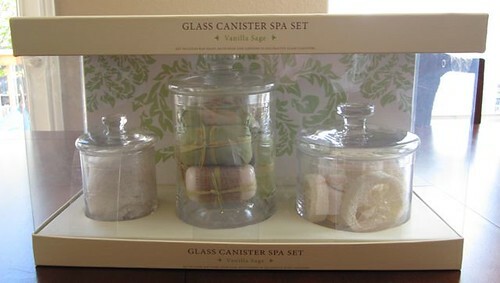 If you have a Costco near you, they currently have the cutest apothecary jar set for $15! 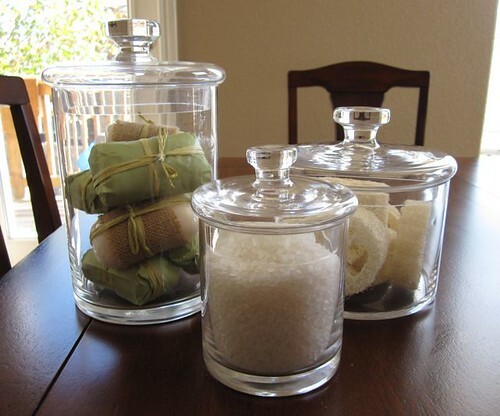 They come with the cutest bath stuff inside them, but these jars are great just for your basic decor as well. Fill them with ornaments, pinecones, beads, photos… basically anything you like decorating with. I can’t believe how adorable these are, and for only $15. I can’t find apothecary jars for that cheap at Ross! And you get THREE!! Once I got the box open I discovered how HEAVY and THICK the glass is. These things are SOLID and in my opinion worth a whole lot more than $15. thanks for the tip! i wish my silhouette machine would come in, you could totally personalize each one for the teachers too! great idea! off to get some tomorrow! I know where I’m heading first thing tomorrow morning. Thanks for sharing. I need this, but I need to renew my Costco membership first. Those are going to be expensive jars! LOL! Great find! Such a great price too. I sooo wish we had Costco up here. LOVE this! Wish I had a Costco closer than 3 hours away! As soon as I saw these on your blog I got in my car and went to Costco. They had 2 left and one was marked down to $12 because the box was smashed on the side. I snagged that baby up!! I didn’t care what the box looked like because I’m keeping them for me!! I’ve been looking for something to put around my tub in the master bath and these are perfect! What an awesome deal! Thanks!! Hee hee, we’re making 100 gifts, including teacher and coworker hifts, and my husband begged me not to post the tutorial until they were distributed because his friends at the school read my blog! It’s nice to know though, huh? Thanks for the shopping assistance, Allison, those are wicked cool! Thanks for letting us know about this awesome deal! I’m going to Costco ASAP!